Let’s look at some ways to put those excuses away and start finding solutions for getting your book to market faster. Create the title and summary of what you want to convey. The title should be catchy and provide a solution or capture a pain point to get peoples attention. The Tag line can further describe the content. My Book “The Productivity Zone” was a play off of being in the Zone running, people have heard of it and it fit with my framework I had created. The subtitle Stop the Tug of War with Time connects with the struggle people have around time management. The while title is a combination of the promise and the problem. I had the cover made to my book as an anchor or symbol that the book was already created, already in the universe and all I needed to do was fill the pages. It was a huge motivation for me and enabled me to see myself already having it done and the joy of having completed it. This is the writers version of the Olympian who sees themselves doing the perfect setup and then winning the gold metal. The book published and in print is the first step to your gold metal. Fiverr is a great resource to get this created for a reasonable price. This is classic goal setting. As a time management minded person, I can’t help but provide some time management tips as part of this process. It helped me so i know it will help you too. If you don’t set a deadline you won’t get it done in a reasonable amount of time. Unless this is your day job you have other things vying for your attention and the other things will win if you don’t create a priority on this effort and see this as a project like any other that needs a plan. Here is what happens with no deadline. Either you will procrastinate on the start and keep pushing off making other things more important, maybe submit to the fear that others may not like what you have to say, wait until it is perfect in your head and then start and all the other non sense we tell ourselves to keep from making it a priority. Or Maybe you fall into this trap, the trap of perfectionism. You get caught up in refinements, edits, grammar and keep rewriting the book until it is perfect. It will never be perfect as every time you read it, you change and have more value to add. At some point you have to collect those possible changes for the next run of the book and look for the 80/20 solution. People are reading your book to take something away, If you have accomplished that and it is well written and you make the points as is, stop rewriting and get it published. 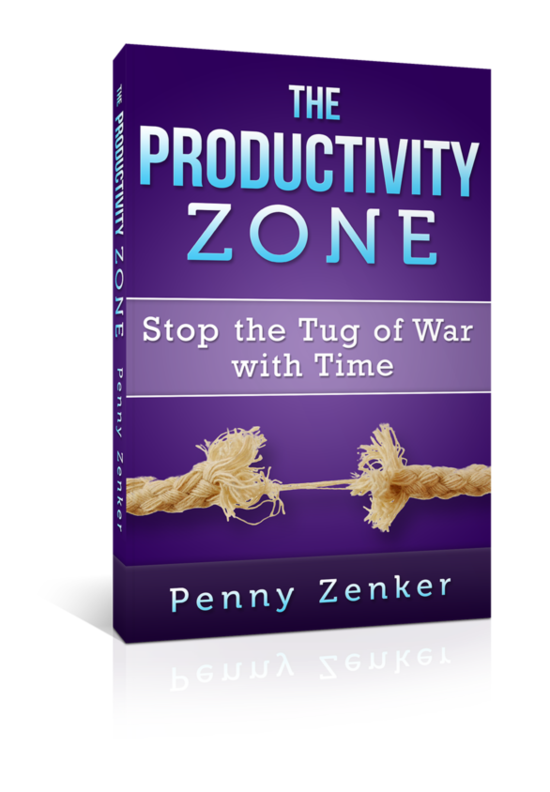 This whole concept of over and under-functioning comes from my book The Productivity Zone: Stop the Tug of War with Time. It is the human condition we struggle with creating stress and indecision in our lives. I set my birthday as my deadline and set a further goal to become an Amazon Bestseller in my category for my birthday. This goal helped me to work my way backwards in setting when the book needed to be published, by when did i need the final draft to the editor, as then broke down the chapter compassion dates. By setting the deadline, I could create the plan and validate its achievability. I gave myself 6 months. In order to meet that deadline, I had to be up before my kids got up and work after they went to bed. This was a labor of love – and i knew the time doing this was limited. I had my goal and i was going to get it. And I did! The outline enables you to define the chapters. It is the first step to breaking it down to make the writing of the book easier. The outline gives you an overview of the flow of the book. My first book was super simple because I have 10 productivity drivers and they are divided into 3 segments so my process leads itself to a self created outline. Do you have a 7 step system or something that can easily help you create this outline. Maybe you want to go through something chronologically or event by event? How will you tell your story or convey your wisdom in a way that is structured and flows for the reader. Define what each chapter will make the reader feel, what are the 3 things they should take away and remember from the book. As a self help or fiction novel these pints can be used a s callouts or end of the chapter summaries. These add enhancements to retention of the book and major points made. Use the chapter takeaways to capture the meaning of the stories and content of the chapter. It might seem obvious but it may not be. Your brain works differently than others. Also people reading may not stop to think about the conclusions, so by including a space at the end of the chapter you are asking for some thoughtful reflection. You will summarize your points that you want to re-enforce and they may have a few of their own through thinking about chapter takeaways. People love stories and remember stories. That is how the bible teaches religious principles, the Indians pass down traditions and medicinal treatments, Stories are how great speakers and comedians keep people engaged. Stories are remembered. Also When you use your own stories people appreciate the venerability and create a bond with you as a result. One speaker trainer said It is my job to make them love me. To make reading easier, more comprehensible and connect people with the point they are reading about, use section headings. Not only does this make writing easier for you, because you can stay focused. This helps break up the text, increases retention and makes it more interesting to read. I find the fastest way to get the content I want to use no matter if it is a blog or a book, is to use the speech to text recognition in notes, email, or dragon dictation and take your organized outline and takeaways and headings and start talking the content. I am much more comfortable talking then I am writing, plus this enables me to do it while I am in the car or folding laundry and saves time in getting my thoughts on paper. Then I can sit down in peace and quiet and review my thoughts and make the edits. For many people it is much easier to edit something than it is to start it. If you are really short on time and not short on money, you can also send these thoughts to a ghost writer who will take your tone and your content and message it into a better draft for you to review and edit. I have recommendations for people who write on behalf of others and do a great job in capturing your tone. You can also test them out with a small sample too to make sure you are happy with their style and translation of your content. No matter how good your grammar is, you are too close to the book to be your own editor. Have someone read through your book for grammar and flow to make sure it is clearly laid out and understood and the grammar incorrect and consistent. I have recommendations for editors as I had two people who did a wonderful job! I must have gone through 50 edits of my book. After a while, you don’t want to see it anymore and just want to get it to market. If you are a women and had a baby you can relate to the process of publishing a book to being pregnant. As you move along in your term and edits like when you are 9 months pregnant you just feel like “let’s just get this baby out now” It is the most uncomfortable part of the process. That is why the deadline is important too. Don’t’ be a perfectionist. At some point you have to draw the line and say good enough. I had a few people review the content for flow and understandability and a last spelling and grammar check and decided I was releasing. There were still errors found after the first publication so then you fix them, most people are reading for content not for perfection. Do keep in mind that too many errors will impact their ability to focus on the content. That is why you have to outsource the editing. You are writing this book for yourself first and foremost. You will be on cloud nine the first time your book is in your hands. I couldn’t stop smiling and showing my book to anyone and everyone that would give me their attention. I was so excited. I kept thinking “I wrote a book! “ again not so far off from the amazement of looking at my children after they were born. OMG, this baby grew inside me and she is now in my arms. It is a crazy feeling. Writing a book was a childhood dream come true. Here are some effective ways to get the word out. You also wrote the book to make an impact and you need to reach people to do that. Get people involved as early in the process as possible. This builds suspense and tension about the upcoming release. Post variations of the cover and see what people like best. Let people know via social media some of the themes. Do a Facebook-live with a story you will use and give a teaching point they can find in the book. Offer the first chapter for free to get people interested. Create a contest for them to submit their ideas or stories that you will integrate into the book, then they will help you promote it. Call Barnes and Nobel and ask them if you can do a book signing. They love to support local authors and if you publish with Ingram Sparks or one of B&N’s authorized publishers they will allow you to do that. This is great for publicity (not selling a ton of books) to get people interested in your book and provide an appearance of success before you really even take off. This can be used on Amazon as well as social media. They are inexpensive to create and look very professional. Here is a suggested Link from Fiverr, check out the other providers and choose one that resonates best with you. As much as social media is great at getting the word out to everyone sees your posts you need to email people and tell them what to do when you are ready for purchase. Take any platform and get out there and talk about it. How are you going to use your book to elevate your credibility? A book opens the door to many opportunities. Even though I had a credible background as a Tony Robbins coach and having sold my own company to public company, that background didn’t get me in to speak at places as quickly as the book did. Instant expert. Here are some venues to promote your message: Radio show Interviews, Presentations and public speaking events with corporations and associations, Book store and library readings, lunch and learn events. What are your ideas for promoting your book and your message? You need to plan these stages out a little. Get a calendar of the year out at set the milestone dates and work backward from there. Without some structure, you could end up like a deer in the headlights stunned, in shock and stuck in place unsure where to go from here. The more action you take the greater the clarity you have as to what works and what doesn’t. You will get better results. Indecision is a killer of our productivity and puts you back into perfection or procrastination mode-so keep moving! If you need further structured support, get a coach to help you set goals, milestones and complete tasks faster. A coach will help you to stick to deadlines and get that book published! Penny Zenker is a strategic business coach and trainer, boosting productivity for business leaders and entrepreneurs. She leverages her personal experiences of building up and later selling a multi-million dollar business, as a senior executive at one of the worlds largest market research companies and working with business leaders all over the world as a Tony Robbins Business Coach. Penny’s proven and practical approach help people to get results quickly.